This Instant Pot Flan / Caramel Custard (Banh Flan) recipe is a cinch to make with the help of everyone’s favorite electric pressure cooker. If you haven’t had Flan / Caramel Custard before, you’re in for a decadent treat. This chilled dessert is a silky and sweet custard made with just a few simple ingredients: eggs, milk and sugar. 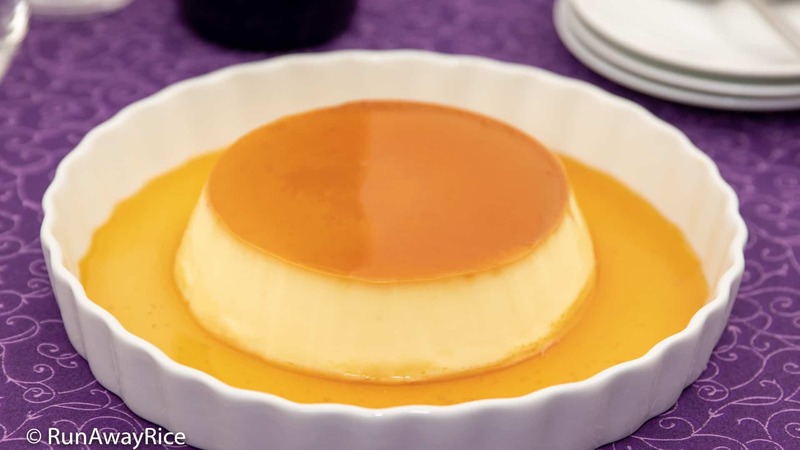 Whip up the Instant Pot Flan in minutes, easily pressure cook it and then chill in the fridge until it’s time to serve. 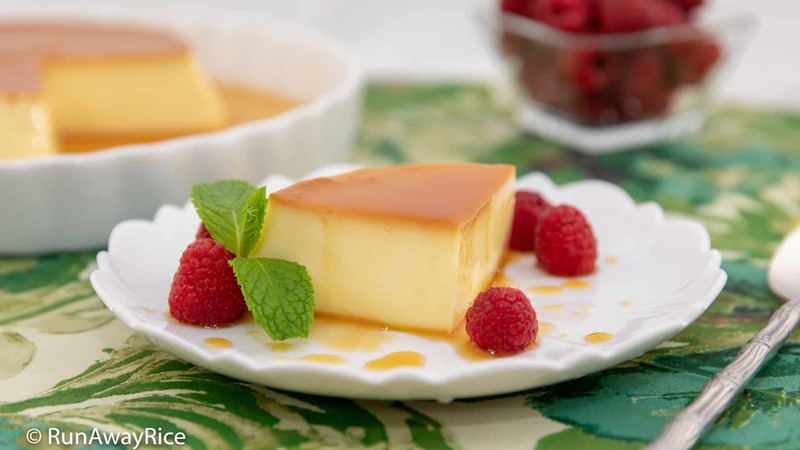 This Instant Pot Flan recipe is simple, delicious and has a huge wow factor. Make some today to enjoy! Use a 4 cup heat-safe bowl for cooking the sugar. Be very careful when handling the bowl from the microwave. The bowl and caramel sauce are extremely hot. Avoid touching the sauce with your fingers. My microwave is 1050 watts and I cook the sugar for exactly 3 minutes to get a golden caramel color. A lighter caramel is sweeter and a darker caramel is more bitter. Cook the caramel to your taste preference. When cooking the sugar in the microwave, add just 5 seconds at a time and then wait for 1 minute to see if the caramel is the desired color. 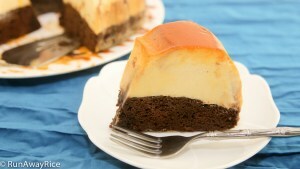 Keep in mind the caramel is still deepening in color even after the cooking time is completed. Be careful not to burn the sugar. It happens very quickly. Instead of the using the microwave, cook the sugar on the stovetop. Cook using Medium Low heat for approximately 5 minutes. For a light citrus taste, add 1 tsp lemon juice to the sugar mixture before cooking. The lemon juice also prevents the sugar from recrystallizing. Whole milk makes a rich and thick custard. Optionally, substitute with low-fat milk. Non-fat milk works but the custard may be a soft-set. The 4 cup bowl fits in both the 6 quart Instant Pot and 8 quart Instant Pot. (I have the 8 quart Instant Pot.) This recipe yields 2 cups custard. 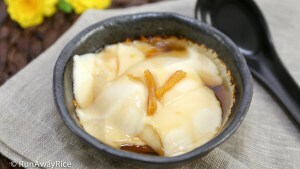 The Flan can be cooked in individual ramekins. If making the Instant Pot Flan in 4 ramekins, steam for 8 minutes. Use Low Pressure to cook the Flan. High Pressure will cause the custard to boil and develop bubbles. This will result in an “eggy” scrambled egg-like texture rather than a silky and smooth custard. After pressure cooking, the center may be a bit jiggly. This is normal. Avoid jiggling the bowl as this will cause the custard to crack. 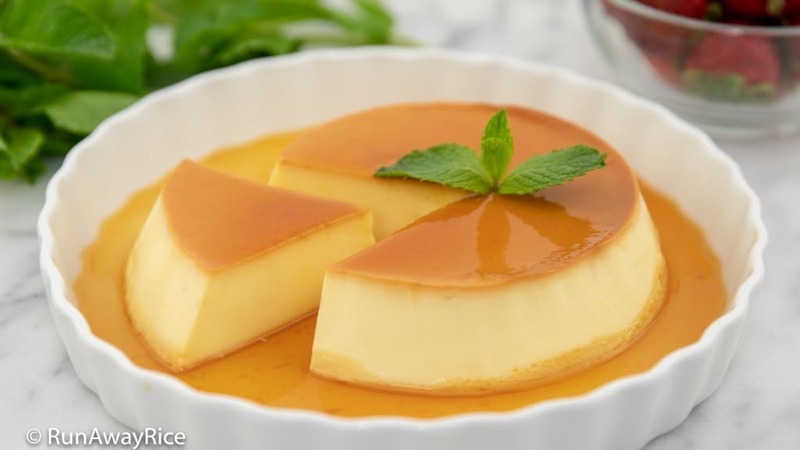 Refrigerate the Instant Pot Flan for at least 6 hours. Overnight is best and helps the Flan to set up nice and thick. In a 4 cup heat-safe bowl combine the sugar and water. Transfer the bowl into the microwave and cook on High power for 3 minutes or until the syrup is golden. Carefully swirl the caramel sauce coating the bottom half of the bowl. Set aside and allow to cool while continuing with the next steps. In a large measuring cup, add the whole eggs, egg yolks and vanilla extract. Gently whisk together until combined. Add the sugar and milk. Whisk together until thoroughly combined. Strain the custard into the caramel bowl using a fine mesh strainer. Cover the bowl with aluminum foil sealing it well. Optionally secure with a cooking band. Add 1 1/2 cups boiling water into the Instant Pot cooking pot. Place the bowl on top of a steam rack or trivet and transfer into the pot. Cover with the lid and set the steam release handle to “Sealing”. Once the cook time is completed, allow for a natural pressure release (NPR) of 10 minutes. Transfer the bowl from the Instant Pot. Remove the foil. Let the Flan cool on the counter for 1 hour. Transfer the Flan into the refrigerator and chill for at least 6 hours. To serve, run a knife around the flan to loosen it from the bowl. Invert the bowl onto a quiche dish to remove the flan. Serve the delicious Instant Pot Flan with fresh berries. 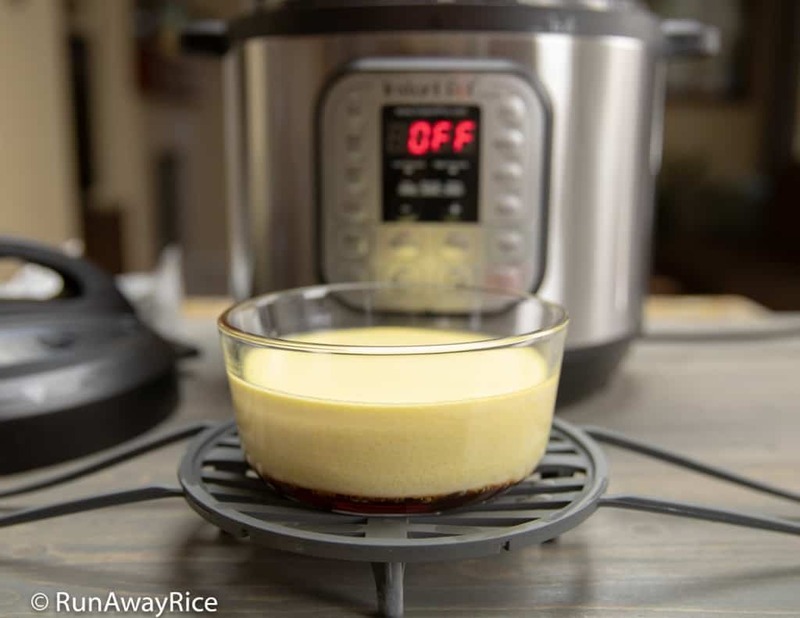 This Instant Pot Flan / Caramel Custard / Banh Flan recipe is a cinch to make with the help of everyone's favorite electric pressure cooker. If you haven't had Flan / Caramel Custard / Banh Flan before, you're in for a decadent treat. This chilled dessert is a silky and sweet custard made with just a few simple ingredients: eggs, milk and sugar. Whip up the Instant Pot Flan in minutes, easily pressure cook it and then chill in the fridge until it's time to serve. 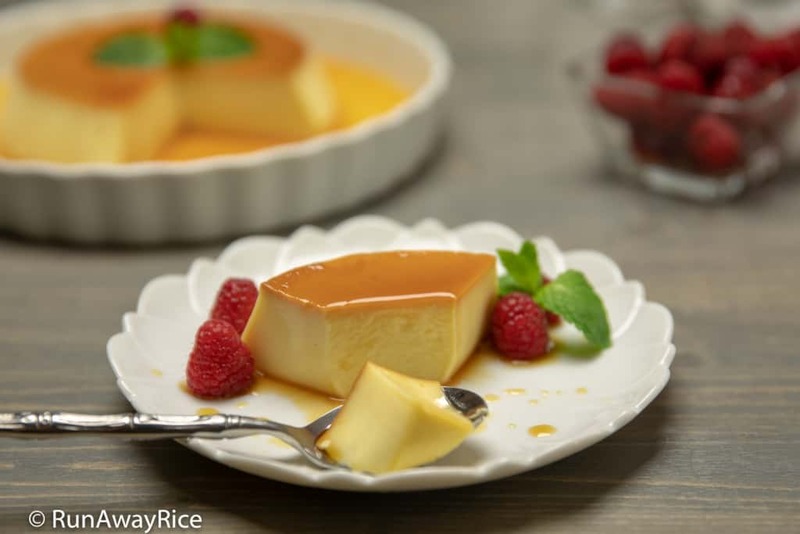 This Instant Pot Flan recipe is simple, delicious and has a huge wow factor. Make some today to enjoy! Place the bowl on top of a steam rack or trivet and transfer into the pot. Cover the pot with the lid and set the steam release handle to "Sealing". Use Low Pressure to cook the Flan. High Pressure will cause the custard to boil and develop bubbles. This will result in an "eggy" scrambled egg-like texture rather than a silky and smooth custard. Hi, can I use 2 – 3 ramekins instead of a big bowl? will the pressure and time settings be the same? 2-3 ramekins would be just fine. Not knowing how deep your ramekins are, I suggest using the same pressure and cook time. Good Luck and let me know how it works out for you. Thank you very much for your reply. I managed to find one 4 cup bowl and followed your recipe exactly and it turned out amazing <3 I made flan several times before in oven but it was not that good. Great and yet very simple recipe! Thank you! If I double the recipe how should i steam it? Are you thinking about steaming it in one round pan or splitting into two pans? Let me know the sizes of your pan or ramekins and I can advise. Hi! I was wondering if the leftover egg whites from the egg yolks could be incorporated into your other recipe for the cotton cheesecake? Or would the proportion sizes now be off too much for the cheesecake? Thanks! This is a fantastic idea to use the leftover egg whites for making cotton cheesecake. It won’t throw the proportions off at all. More egg whites will make the cake fluffier and a bit jiggly. Enjoy! Hello! Thank you for this awesome and easy recipe! Since I’ve been paleo, I made this flan using coconut milk and coconut sugar instead and it turned out perfectly the first and second time, but not at all the third time around. So my question is – what went wrong? My third attempt (which was the same night as my 2nd one) came out completely liquid. It’s as if it had separated, so it looked translucent. Only differences I can think of between the two batches was that 1) I used 195 degree water vs. 212 degrees boiling, and 2) the instant pot might still have been pretty hot from the previous batch. I put the sad flan back in the IP for another 12 minutes to see if it will come out right, but I don’t have high hopes. I’m just looking for a reason why this happened so I can make sure to avoid it next time. Thank you!! I am glad to hear you made this recipe paleo using coconut milk and it worked initially. I am curious: what type/brand of coconut milk did you use and were all 3 batches from the same container? I’ve made this two days in a row. Flan every day ! Nice for breakfast or dessert ! Very delicious! Thank you for a recipe with less sugar and a bit lighter too . I’ve been trying to make flan for decades. I love this recipe. Now I have to make again. Not once have we waited to let it chill to flip and unmold all pretty. Flan is yummy warm too lol . I strain it 4 times and I am amazed by how silky in texture it becomes. 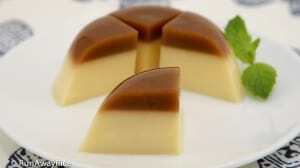 Flan for breakfast! LOL 🙂 I am so glad to hear you’re enjoying the recipe. Your family sounds like mine and can’t wait for the flan to chill. Hot or cold, it’s delicious! Thanks for stopping by to share your results! I did exactly as per your instructions but after 10 mins natural release it was still very runny. Do you know why it did not set? That’s how it should be. It will set further after refrigerating. Good Luck! Is it supposed to be watery after steaming it? Or was I supposed to use the pressure cook button instead of the steam button? Use the “Steam” button with Low Pressure for this recipe. The flan is jiggly after cooking and will set up in the refrigerator. Let me know how it turns out after you’ve chilled the flan. Good Luck! Hi Kim- I’m trying to make the caramel in my microwave, but the mixture has crystalized before turning browning. I think my microwave is a lower wattage than yours. Try adding 1 tsp lemon juice to the sugar to prevent it from crystallizing. Good Luck!